It's absolutely no fun to miss a concert. 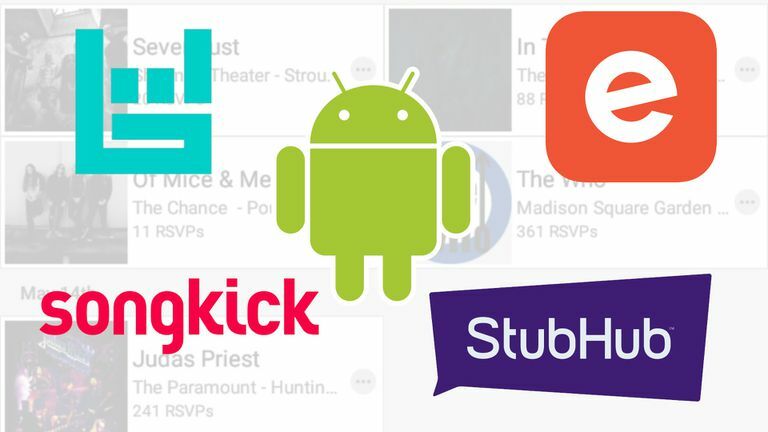 These Android concert apps keep you informed whenever your favorite artists are going to be in your area, so you'll never miss another performance again. Complete lists of local concerts. Interface takes some getting used to. Bandsintown Concerts provides an insanely convenient way to find both smaller local shows and big name acts coming to your area. The app begins by taking a look through your device's music library or any of a number of sources, including Facebook, to find artists you're interested in. From there, it'll begin tracking concerts featuring those artists, as well as similar ones, and you can manually browse by genre or search for additional artists to follow. Bandsintown aggregates all of this into a complete calendar of shows in your area featuring the artists you tracked and similar acts. You also have the option of searching through all local events by music genre. These listings are easily the most complete, showing smaller acts and lesser known local venues. Search in "areas" rather than by distance. Songkick Concerts is another popular option for discovering upcoming events in your area, with great suggestions that extend beyond your most immediate range. Once you've signed up, Songkick asks to scan your local music and/or Spotify account, along with your Spotify account's preferences, to improve its recommendations for artists and upcoming events. If you don't use Spotify, the artist search process feels awkward, with Songkick asking you to pick 20 artists to create a somewhat limited list that only covers the most popular acts. However, Songkick will make a valiant effort to suggest similar artists. That said, Songkick only provides concert listings for the artists you explicitly tracked. For smaller local shows, Songkick uses an "area" based system where you can pick a town or city near you to track shows. Unfortunately, you can't sort these listings by genre, and Songkick doesn't include the smallest venues. More than just a concert tracker. No focused way to search. Eventbrite is more focused on local events, rather than strictly music, and might be just the app for you if you're okay going to see a smaller local band. Eventbrite lets you search by city, type of event, and time frame. So, if you want to find which music events are going on in New York this week, you'll have no problem finding what you're looking for. You can also use Eventbrite for other types of events, including food and drink, the arts, and even family friendly activities. Eventbrite is all streamlined, and it helps you get to your destination hassle-free. By signing up, you also gain access to purchase tickets for some events straight through the app. Can find more than concerts. More focused on selling tickets. With StubHub, you can track your favorite artists, along with other events you're interested in, like sports and theater. It lets you know when events are coming up near you, and you can buy your tickets directly through the app. When you first launch StubHub, you're given a list of nearby events you might be interested in. Select the ones you like, and StubHub will build a profile for you, including event suggestions. The home screen of the app suggests upcoming shows, in no particular order, based on your preferences. When you sign in to StubHub, you can build a list of your favorite artists, and StubHub will also track events you've attended, making it easy to receive notifications whenever an artist is back in the area. Unlike other ticket purchasing apps, StubHub covers all major venues, regardless of who owns them or is promoting the event, making it a more convenient solution for tracking and buying tickets.